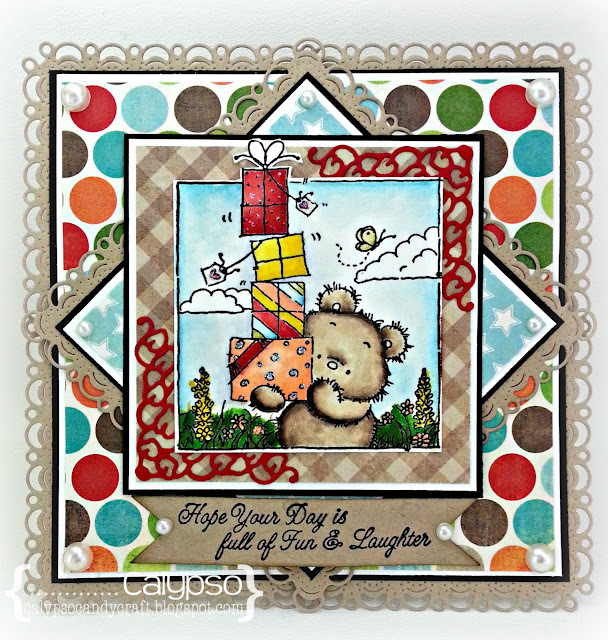 It's Thursday already and time for another fortnightly challenge over at Seize the Birthday!! I am so glad to be on this team, because I have pulled out some stamps that I won and never got around to using til now!! I know shame on me, especially since they are so darn cute!! For my card today I am using LOTV: Fun Birthday and I've colored it using distress inks. 1. You must make something with a BIRTHDAY theme. 2. Please add a direct link to your blog or to an online gallery. 3. Feel free to use other challenges or for a stamp release, it doesn't matter, as long as you add this challenge link to your post. 4. Any offensive posts or cards that do not follow the guidelines will be removed out of courtesy to fellow bloggers and the design team. Looking forward to seeing what you create for us. Your card is so cute. I love the layout, and all the details. The image is so sweet and colored so nicely. What a sweet card. Love that adorable image and all the layers on your card. Glad to be on the team with you. Super cute card love the image. Thanks for joining us at SweetStamps.com come back next week for the Butterfly challenge!! Such a super cute image and I love all the patterned paper! Glad we're on the STB team together! This is adorable! Gotta love those LOTV images! Fantastic job, Nazeema! The coloring looks great!